Budget 2017 is out and has everyone buzzing, including us at KCY at LAW. While we have previously talked about the basics of pregnancy and parental leave, new proposals in the Liberal Party’s 2017 Federal Budget may soon make some of that information out-of-date. 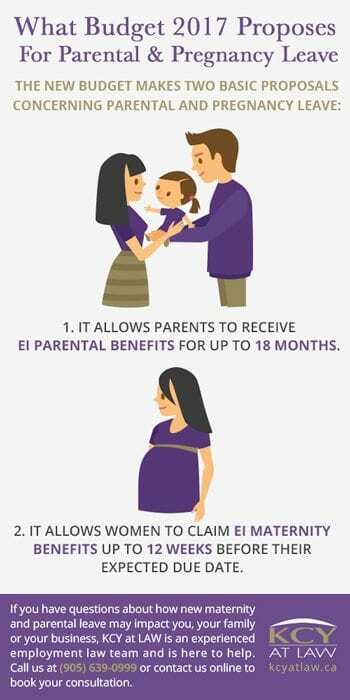 It allows parents to receive EI parental benefits for up to 18 months. It allows women to claim EI maternity benefits up to 12 weeks before their expected due date. The Budget promises to give families more flexibility when they are welcoming new members into their nest. More time off for parents certainly seems like a step in the right direction for families facing the stress and excitement of managing their young brood. But these new benefits have a catch. While parents can choose to take up to 18 months off following the arrival of their child, they can only do so at a benefit rate of 33% of their average weekly earnings to a maximum of $362 per week. Stretching the time parents can take off also means stretching their funds to do so. Fortunately, parents still have the option to take only 12 months off at the present EI benefit rate of 55% to a maximum of $543 per week. So, while the new budget might allow some families to spend more time with their new arrival and save on costly infant care, they will have to tighten their budgets in order to do so. The government plans to achieve these objectives through amendments to the Employment Insurance Act and the Canada Labour Code. This means it could take until next year for these extended benefits to be available to Canadian families. If you have questions about how new maternity and parental leave may impact you, your family or your business, KCY at LAW is an experienced employment law team and is here to help. Call us at (905) 639-0999 or reach us online.